In this business I’m often asked the question, “Do you do free estimates?” The answer is; it depends. It depends on how busy I am and how far away you are. Most of my jobs are small in scale (handyman not remodeling/contracting work) making it economically impractical to spend chunks of time driving. However, if you can describe what needs done, I can usually give a ball park number over the phone. Should you be shopping for multiple quotes I’d prefer to be last; doing the work the same day should you accept. Side note: I don’t claim nor want the reputation of being the cheapest guy in town. I do want to be known as someone who does honest,quality work at a fair/competitive price. “Good work is not cheap and cheap work is not good.” I back all my work with a one year guarantee. All quotes large or small will be in writing,listing detailed labor and material costs. On larger jobs with significant materials a deposit may be required to start. Full payment is required when work is complete to customers 100% satisfaction. We accept check, cash and major credit cards. Finally when choosing remember to compare apples with a apples. Your deciding to allow someone to work on your largest single investment and entrusting them in and around you and your family. Choose wisely. Each of the pricing options listed below have advantages and disadvantages. The kind and scope of work is the determining factor. Our hourly rate is $60.00 . We have a minimum of $120.00 (2 hours) when we are busy. (There are exceptions) We round up to the nearest 15 minute increment after that. Working by the hour makes sense when you have an on going list of miscellaneous tasks. Some people even rent out handymen for their mom or grandmother for a day. Finally, because we’re not like big franchised companies we have the freedom to make exceptions with price. I often cater to the needs of those on a fixed income. I gladly on occasion donate my time and service. In no way feel awkward if your in need of help, but you have to let me know. Don’t sweat it, it’s no big deal. Using this method I determine all labor and material needed to complete the job. If I fail in my calculations and it costs me more, that’s my problem, I eat it. Barring unforeseen conditions, changes to the scope of the work, or other circumstances that may be set forth in the agreement. This method protects both you the customer and me the contractor. If I look at a job and see a bunch of ‘what if’s’ I’m going to pad the price in my favor. If worse case scenario happens I make my standard profit and you pay no more than quoted. In a best case scenario the unforeseen turned out to be non existent, I’m done ahead of schedule and you save the difference. 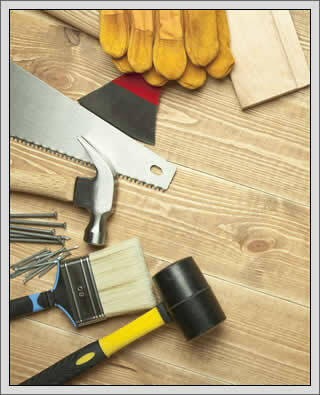 Some jobs like drywall, flooring, roofing etc. have a price per square foot or some other unit of measurement. A unit price is given,then you simply multiply the dollar amount by the quantity of units to get a total. This is pretty straight forward. I have knowledge, skills or tools that you don’t have and visa versa. If my bills are paid up and not in immediate need of money, I gladly barter. Talk to me for further details of creative ways of exchange.